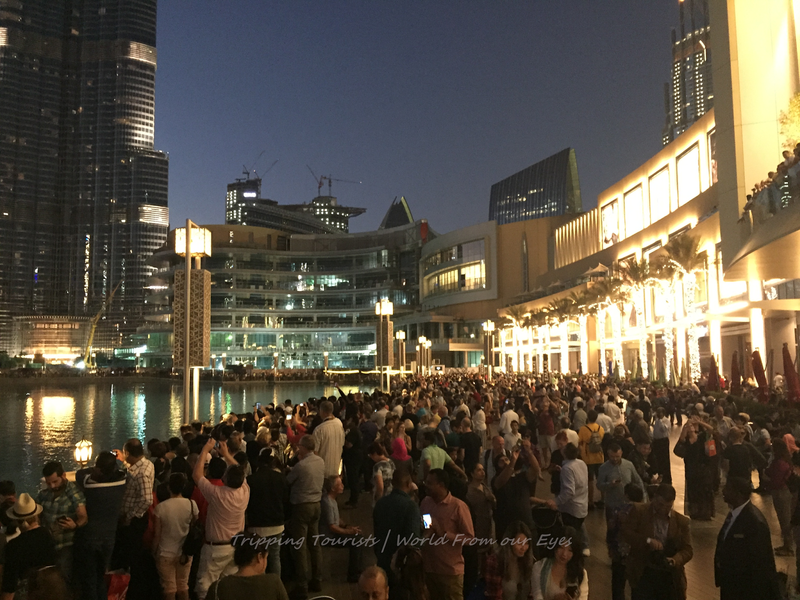 Dubai is a destination of dreams to many and is the perfect shopping hub for those with riches in the pockets. The City of Gold as it is referred to at times is a perfect face to the otherwise conservative society that is synonymous with the region in general and the country in particular. The rulers of this emirates were the first ones to realize that dwindling oil reserves would soon be over and traditional dependence on this natural resource as a backbone of the economy is no longer a sustainable model. This realization quickly was turned into an action which transformed this once a port city into a cosmopolitan megacity home to varied superlatives. While tourists look to cover the entire city in whirlwind tours to various spots, I had an opportunity to spend some extended time in the city as part of one of my client engagements. The two weeks I spent in the city gave me a chance to explore various areas of the city at a relaxed pace and this article emanates from that experience I had in the city. Here we would like to offer you a glimpse into the city and what are various things which could interest tourists into opting this as the destination of their choice. We bring to you the 10 most iconic spots in the city which are must to have on your itinerary of the city if you plan to boast to your friends that you did spend time here. Another dream that a tourist to Dubai has lived through is the charm of Desert Safari – an adventure ride in the raw natural terrain of this Arab country. A gradual immersion into the brown expanse with dunes shifting locations with the changing winds is an experience to be lived first hand. 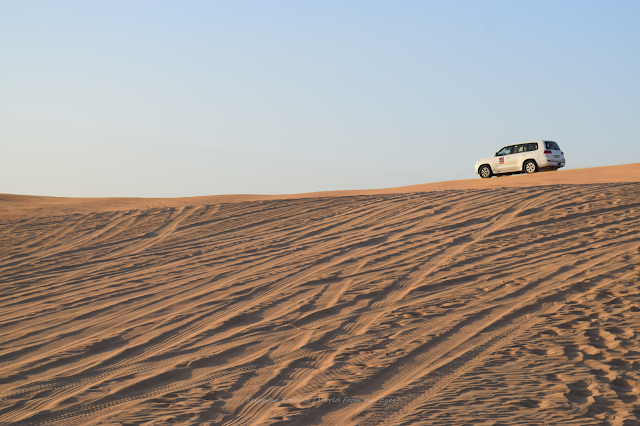 The impressive Toyota Land Cruiser 4X4s zip you off the highway and take you through the rough haphazard natural arrangement of sand dunes. I am sure words are not enough to do justice to the experience and hence I would just leave you with a recommendation to not miss this attraction. What I would recommend you though is to carefully negotiate the deal as the options vary a lot. While you may get some cheap packages but there is a good chance they would take you to a nearby compound rather than a good spread out desert. So it is recommended to confirm all the details of where the safari would be conducted and what all is included as part of the package. Also, I would suggest opting for the evening Safari as that is one which comes at a perfect timing. 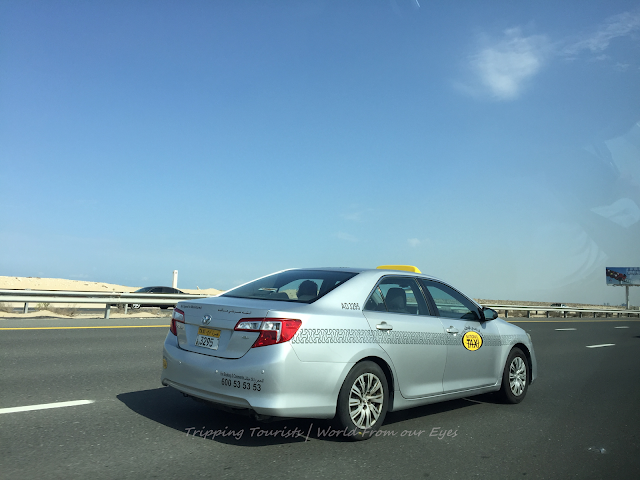 Generally, the package includes – pickup and drop from a hotel or specific points in city, a belly dance performance, a dinner buffet and of course the 30-35 minute bumpy ride on the sand! 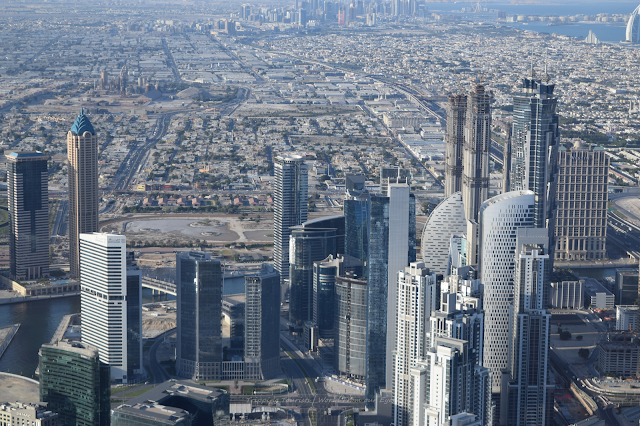 Located in the city center amidst various skyscrapers, financial district, and offices of global conglomerates, this Emaar creation stands firm attracting tourists. 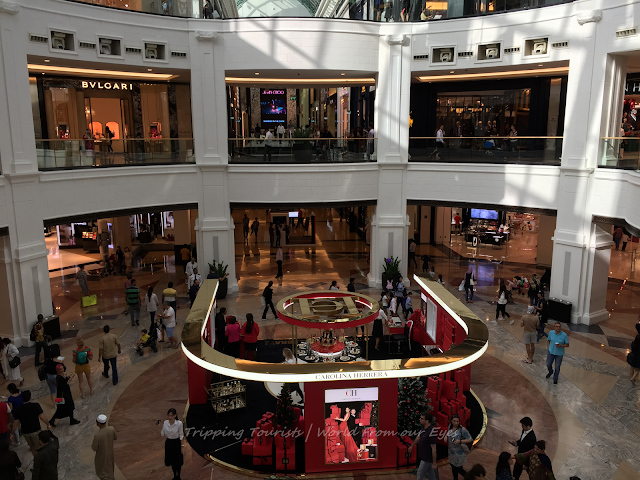 Dubai Mall is no doubt a shopper’s paradise for all tastes but that is not the end of it. The vast complex of the mall houses a multitude of tourist attractions within its gamut. One of the most famous spots within the Mall is the Dubai Fountain. The spectacle of water, light, and music is a captivating sight at the Burj Lake with a height of over 900 feet across an area equivalent to 2 football fields. Visitors have an option to enjoy the performance while riding a traditional boat in the lake or from the floating platform – the Broadway - around the lake. Another landmark situated in The Dubai Mall is the Dubai Aquarium, which is the largest suspended aquarium on Earth. With a capacity of over 10 million liters of water, you are bound to see species of fish you have never seen before. The 48-meter long tunnel gives you 270-degree views of the of the gigantic aquarium with an option to check out the underwater zoo that houses Sea otters, piranha, penguins and many other animals. Another shopping mall slightly away from the Dubai Mall, this is yet another storytelling the extravaganza and glitter that this land entails. Long, broad aisles of shimmering shops line on both sides along with a generously large food court serving a variety of cuisines and tastes is what one experiences as you move from one corner of this mall to another. 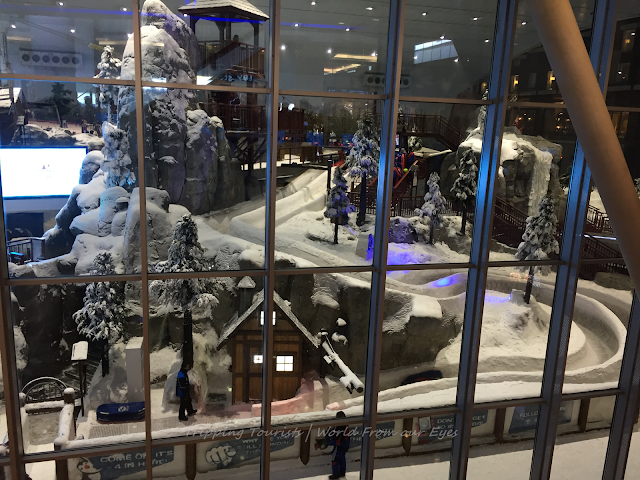 However, as with most of the shopping malls in the region, this one has its uniqueness in hosting a theme park like no other – the one that is called Ski Dubai. It is difficult to imagine that a land known for its scorching heat would invite you to an experience of Alps from Europe. They have developed a theme park in the center of this mall, which provides various rides designed after the themes of various hill peaks of European Alps including gondola rides, cable cars, snow slides and a lot more. I was definitely taken to my times in Switzerland when we were on a trip to Mount Titlis and I could clearly link the similarities this design had to that experience. Obviously, they have tried to provide the entire glass cage with ice all around to take you away from the realization that you are so close to the equator in reality. 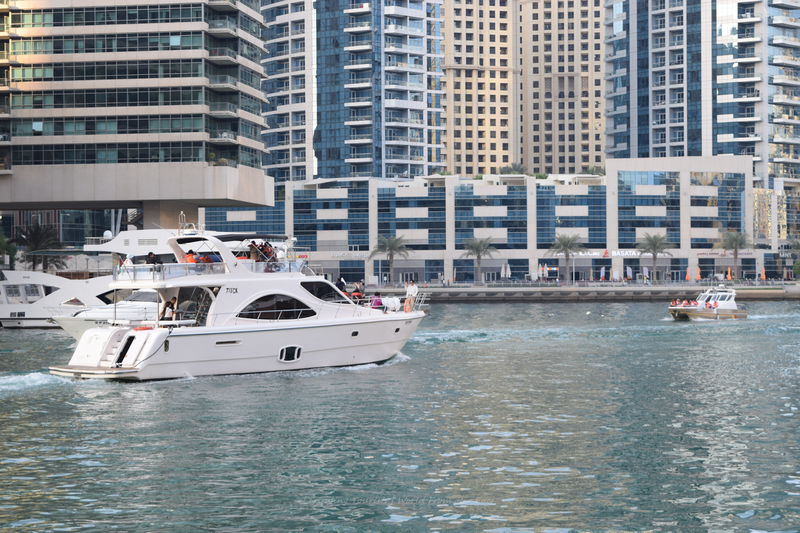 Dubai Marina is a residential district built along a stretch by the Persian Gulf and is a symbol of Dubai’s affluence. This is an artificial canal city built around artfully developed water channels around it. At the center stage of the district is the spacious Marina Mall which provides shoppers with another paradise in this dream city. The Marina walk is the famed center of activities in this zone which blossoms with activities as the evening dawns in this region. There are various eateries, cafes, and shops along the walk for keeping you engaged. It is an idle place to spend an evening with family. Additionally, at the far end of the walk, there is Ferry Station from where a ferry takes you to high seas every day at the designated time. 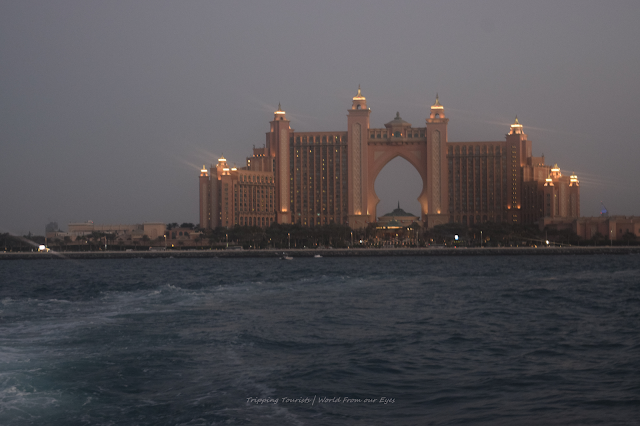 I would actually recommend the evening sunset ferry that takes you around the Palm Islands and provides an awesome view of the Atlantis from the sea. As the sun sets behind the gulf waters, the reddening skies cast a spell over the island city and the scene is mesmerizing. 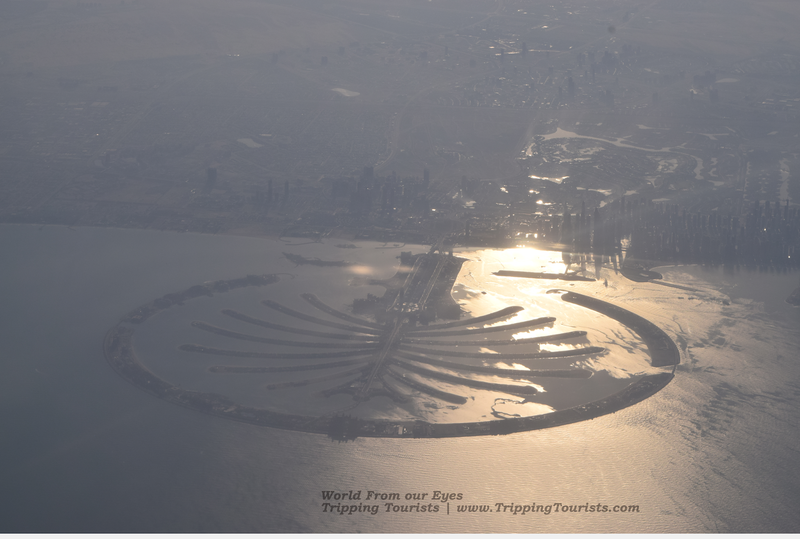 This area includes the palm islands and the coastline around the connection of the island which is habituated by those who have enough to spend and forget. There is a pristine beach along Jumeirah which provides crystal views of the seas and the Palm Islands from far. Further, there is Madinat Jumeirah which is a posh shopping and fooding complex providing a plethora of options to hang out again if you have the moolah. The view of Burj Al Arab from this area is simply marvelous and you can witness the imposing tower standing tall in all its glory. 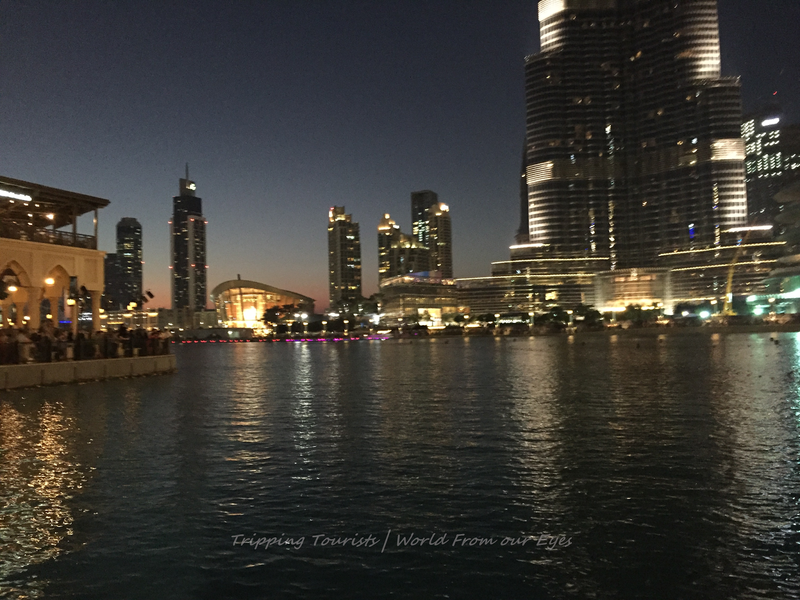 Dubai is not all glitter and shimmer of modernity – while there are all the modern and cosmetic advances that the city brings alive, it has equally rich history behind it. Shopping malls, on one hand, showcase the affluence, there is an equally interesting old city which occupies an important corner of the city. As you take the metro ride towards the far end of the city, you enter the still-raw old part of the city where mom-n-pop stores and friendly retail stores don the streets trying to attract customers in their traditional ways. 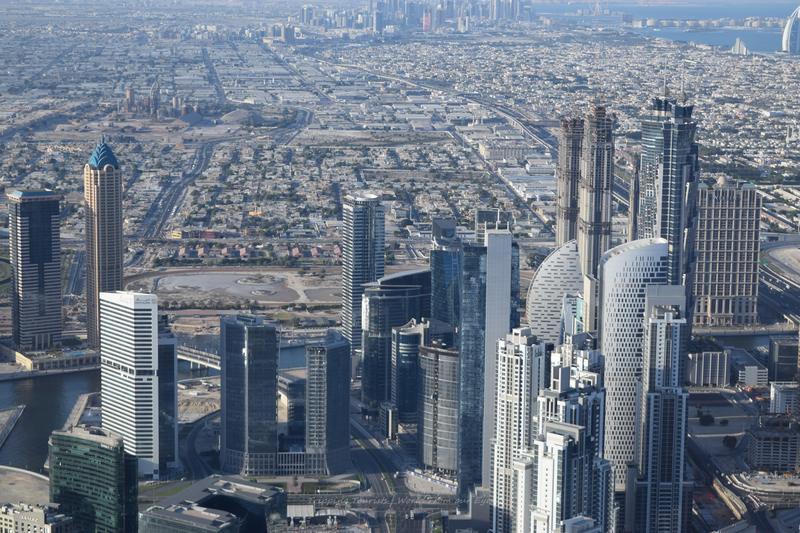 This region is popularly called Bur Dubai – an area popular among Asian expats who have settled here considering the low rents. One of the landmarks in this area is the Al Fahidi Fort - at the Al Souk Al Kabir area which teems with vigorous trade and is close to the Ruler's Court (the monarch's divan). 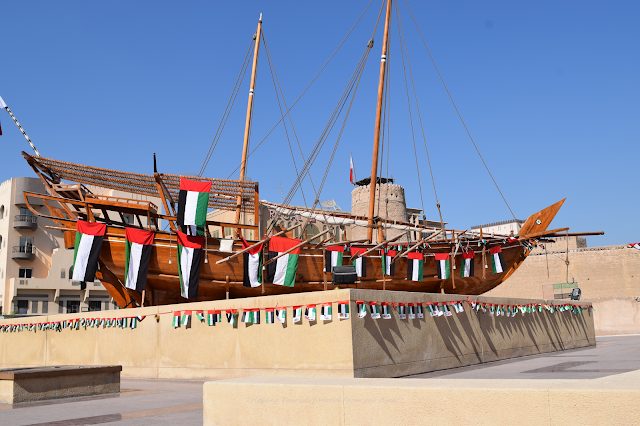 It was built back in 1787, about 200 years ago, as the premises of the monarch and a fort of defense, since it sat on the border of the urban Dubai at the time. Later on, this fort turned into an arsenal of artillery and weapons. The visitors of Dubai Museum "Al Fahidi Fort" have an opportunity to get rich, full and integral knowledge of the very old history of Dubai as the museum within the fort has been developed and maintained by the authorities. This is a saltwater channel flowing through the old part of the city and divides the city into two parts – Deira and Bur Dubai. 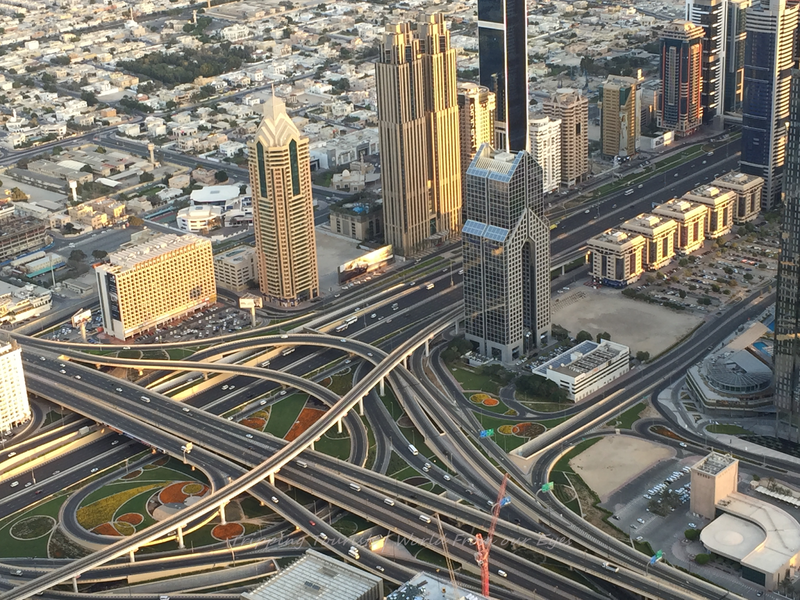 It is an important part of Dubai’s iconic locations and provides tourists with another aspect of Dubai. While you are at this location one thing that you cannot afford to miss is a ride on the traditional wooden boat – Abra. 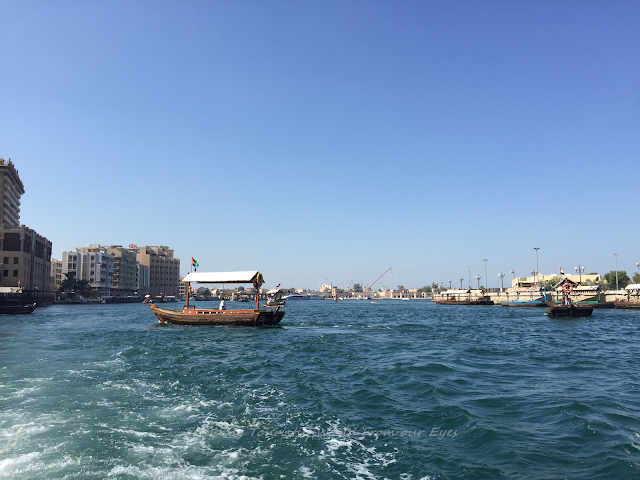 The motor operated small boats – once manually propelled – charge as high as 1 Dirham to take you across the creek. The slow ride along the waves is definitely a worthwhile experience witnessing the confluence of history and modernity. Beyond the creek is the hidden treasure of the city which attracts a specific kind of audience – one which is unimpressed with the glitter of modernity but prefers the glitter of metal - yeah the famous Gold Souk area of the city is here. One would be astonished on entering the area with the precious metal all around – shops big and small showcasing the priced products on sale. To the uninitiated Souk are traditionally unorganized road-side markets – something that western world knows as fleece markets – which have over time taken to some kind of structure and found themselves roofs. However, the method of exchange is still very undefined and you can definitely negotiate your way to a good deal. Also, a short distance from the Gold Souk is the Spice Souk where spices from the region are available in various forms and flavor. A theme park dedicated to spreading the Hindi movie industry globally is something every Indian would like to visit. Developed in close coordination with the various superstar of Indian movies, this theme park boasts of rides designed after iconic movies like Lagaan, Rock on, Krish etc. This is a good visit but only if you have an entire day at your disposal as it takes a lot of time to explore and enjoy this destination so that its worth the money you spend there.